A booster starting it's burn at 18 km altitude and a horizontal velocity of .83 km/s has some advantage over a regular booster. There's also disadvantage; it has to start with very large AoA while surviving ~8 kPa dynamic pressure or have wings. How is the 8 kPa dynamic pressure arrived at? I'd like to include the equations in my spreadsheet if possible. The 8 kPa dynamic pressure would decelerate the vehicle, correct? I am thinking the .36 km/s I have at the top is optimistic. R7 might be referring to the atmospheric pressure of 8kPa at 18km altitude. Angle of attack. If the vehicle has traditional rocket shape, pointy end forward, slim body and engines in the aft it must point the nose up and initially fly "sideways" to counter gravity and rise. That's tough on the structure. Alternatively you can have weird engine placements like Alf mentioned, either near the center of gravity or otherwise evenly distributed (both aft and nose) but that brings up challenging structure load paths too plus potentially issues with plume hugging the body when the vehicle begins to go where it is supposed to. Not referring to the ambient pressure, just a coincidence that its almost the same. Air density (rho) at 18km is 0.12kg/m3, speed 360m/s, when those are plugged into above equation it gives ~7.8kPa of dynamic pressure. And yes that pressure drags the vehicle down. To calculate how much exactly you need the actual drag equation. Note how that begins with dynamic pressure. Also worthy of note how the dynamic pressure is denoted by "q", that's what the q in "Max Q" means, maximum dynamic pressure. I do not think those equations can be applied to trans-, super- and hypersonic regimes. The result can be an order of magnitude or more larger. Yes they can and are but the CD varies with speed so it's profile must be known for accurate modeling. Even if you could dial the mass of an object up and down, it wouldn't do what you suggest. Centrifugal force is proportional to the mass just like the force of gravity is. The ratio is always the same at a given position on the Earth's surface or above it, and it doesn't depend on mass. And the Alcubierre Drive is an idea for a configuration of space-time that would move faster than the speed of light. It has nothing to do with changing the mass of an object. The Alcubierre Drive is also known to be impossible with known physics -- as is changing the mass of an object without moving the mass somewhere else or converting it to an equivalent amount of energy. At Sea Level you will have a vehicle separating from its carrier at > Mach 1. 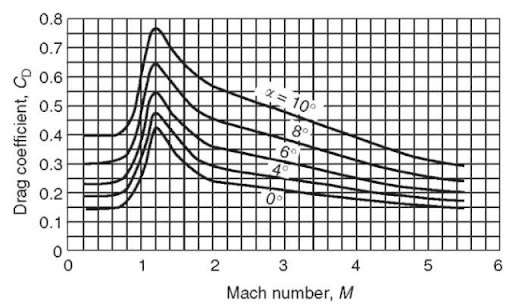 I can't recall how Mach varies with air pressure but you'd be pretty close to the M1 drag "hump" but probably not far enough above it for the drag to have subsided before you'll need to start the engines. If you're going with a sort of tipped over VTOL SSTO you'll have quite seriously asymmetric forces on the vehicle and still need an engine system with thrust close to mass. If you go with winged configuration you'd be smart to put the engines near the Cg as you're probably wanting it back. The full Mach range of a launch vehicle, relative to all other flying machines is huge. The massive fuel burn gives a huge Cg shift while the Mach range gives a huge Cp shift. Before anyone points out "Maybe, but Shuttle handled it" I'll say Shuttle "handled it" by a)Throwing away the propellant tanks b)Having a must-never-fail package of APU/GPC/flight actuators which had to be continuously running during landing and c) A landing speed and weight that meant the tires were good for 1 use. All to cope with the fact that sticking the engines at the back makes you very tail heavy and a tail heavy glider is not a good idea to start with. Wikipedia tells me earth's scale height is 8.5 km and that rho at sea level is 1.225 kg/m^3. So using exp(-altitude/scale height) * 1.225 kg/m^3 I get a density a little higher but I'm hoping my procedure is generally correct. I'm attaching an attempted spreadsheet for drag force and dynamic pressure at different altitudes and speeds. For the 18 km altitude at .36 km/s scenario I picked a drag coefficient of 1 since it's flying sideways through the atmosphere. At Sea Level you will have a vehicle separating from its carrier at > Mach 1. Not at sea level. 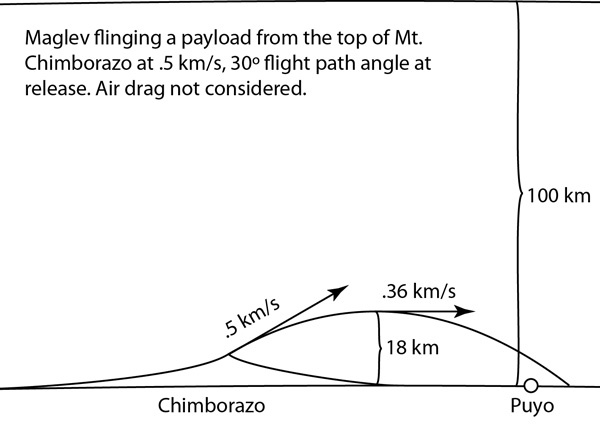 My illustration shows separation at the top of Chimborazo which is about 6400 meters. At this altitude I get air density about half that of sea level. For .5 km/s and half of sea level density I get a dynamic pressure of about 72 kilo pascals. I will admit I didn't know what kilo pascal dynamic pressure meant. So I tried to calculate quantitites to compare. Googling max Q of space shuttle I see 442 m/s at 1100 m altitude which seems to be about 33 kilo pascals. So using those numbers as a yardstick, 72 kPa seems very challenging. I think I set up my spreadsheet correctly but dynamic pressure is new to me so take those numbers with a grain of salt. .5 km/s is about mach 1.5. Using the chart r7 posted and assuming a bullet shape I am guessing a drag coefficient of .4. Using a drag coefficient of .4 and a space ship of approximately Falcon 9 dimensions I get a drag force of about 300,000 newtons. Since Falcon 9 is about 500,000 kg, that comes to an deceleration of .6 meters/sec^2. The deceleration isn't as large as I thought it would be. The drag isn't huge because your vehicle is quite massive and enjoys the benefits from cube-square law. Falcon 9 experiences greater drag deceleration because when it is going 0.5km/s it is already a lot lighter than 500000kg. The spreadsheet looks OK. The simple scale height gives slightly different values for density because it assumes constant temperature. I got the number from online international standard atmosphere calculator. But in this case the scale height is quite good, simple and "close enough". IIRC the "best" AoA is around 70 degress to the horizon until you get above the effective atmosphere. So it would come out of the rail, er, "Maglev" (grin) nose first at 30 degrees with the engines balancing the drag forces to keep itself "alinged" and increase the AoA to around 70 degrees till it gets above 100km. Part of the reason the TMP "Bifrost" launcher went up the center of Kilamanjaro was to allow a built in "AoA" of a bit less than 90 degrees (I seem to recall it was somewhere between 75 and 85 but not sure) so the vehicle would not come back down on the mountain but be able to fight its way over to a gliding landing if need be. The main problem with the idea was (among others) that the given length of the launcher and the needed "muzzle velocity" required somewhat over 12Gs worth of accelleration to accomplish and STILL needed the laser array to achieve orbital velocity. "Longer" track required a curve to keep the depth managable and it was clear with some calculation (later) that you couldn't make the curve shallow enough to NOT turn the passengers into strawberry jam. Suggestions on putting it up the "side" quickly ran into the difficulties of getting from about 30 degrees AoA to the needed over 70 degrees as noted here. Then of course DC-X was flying and everyone got onto the bandwagon "assuming" that SSTO was just around the corner and the whole idea fell by the wayside. The main problem with the idea is that mountains that "fit" the bill are hard to access. does everyone agree some numbers would work for something along these lines? Is a mag lev up Olympus Mons a possible way to achieve orbit? This Mars fact sheet gives Mars surface density as .02 kg/m^3 and scale height as 11 km. Altitude of of Olympus Mons is about 22 km. Mars orbital velocity is about 3.5 km/s. Plugging these numbers into my spreadsheet I got a dynamic pressure of 17 kilo pascals. That's about half of the shuttle's max Q. So I am guessing Mars' atmosphere isn't a show stopper for an Olympus Mons rail gun. Does electric haulage (i.e. TESLA Semi) make high altitude operations and infrastructure any more viable? Perhaps, making an upper-stage landing pad easier to construct. Right. That would cut the cable length from 35,786 km to 35,780 km. The transit time on the cable could also go down by 1.7% of 1%. The longest part of a plane ride is when you are at the gate but cannot leave your seat because people are blocking the isle. Imagine traveling all the way back from Mars and then descending the cable for a week. The last 5000 meters will be grueling. You could see clouds and a horizon but you are still stuck in that can with the same smelly co-pilot. From Olympus Mons you would need a rocket to straighten out the 18 degree north. Pavonis Mons is at the equator. It is 14km so would have a lot more air than Olympus Mons. Arsia Mons has 20 km peak around 10 degrees south. The northern part of the caldera is lower but gets closer to 8 degrees south. Pavonis Mons gets equatorial sunlight, it likely has glaciers, and there are some nifty lava tubes. The rail gun only needs to reach the Phobos tether. I didn't read the contents of this entire thread yet.... but I had a similar idea when I was a teenager. This idea wasn't for manned launches to space. I was contemplating the possibility of constructing a large scale rail-gun style payload delivery system. I wanted to know if it was possible to launch a small payload via nuclear powered rail gun launched from the top of a very high mountain. Additionally, the payload should be constructed as a ram-jet assisted rocket. (Charge up the railgun, and fire it... assist with real second stage style rocket engines).